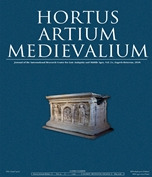 Hortus Artium Medievalium HAM 24, 2018. CARE (Corpus Architecturae Religiosae Europeae, IV-X Saec.) – The Meaning and Use of Corpora.